My wife Steph in the background. Our new 2015 BMW 228i w/ M-Sport, Lighting, and Climate Pkg. RWD & 6 Speed manual transmission? C’monnnnn. Check. My sporadic postings (and internal dialogue) of late have mostly revolved around our growing disdain for our XC90. We went from being the hot hatch couple rocking a GTI Autobahn and a Cooper S to moving cross country & thinking we should have a bigger car that was more capable for what we perceived to be“PNW Lifestyle”. You know, AWD for national park trails & mountain passes, cavernous space for camping, etc. We somehow ended up with a floaty-vanilla-mom-mobile and could only blame ourselves. While we’re certainly taking advantage of all of those things, the car move had both of us (yeah, her too...I mean, we’re married for a reason) feeling a massive void in our life. We missed rowing our own. We missed spirited driving. 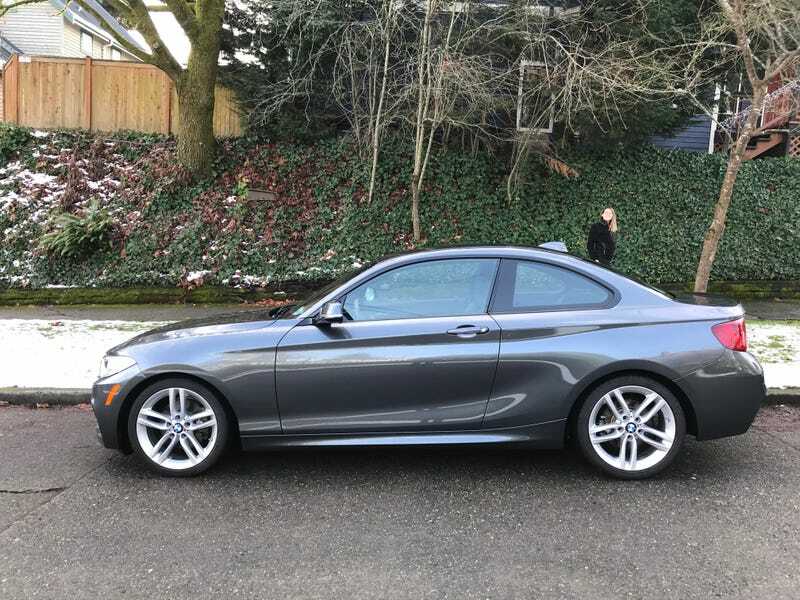 So...after months and months of compulsive car shopping (lol, okay..that’s most nights ¯\_(ツ)_/¯ ) this popped up and we drove to Portland, OR on Christmas Eve. Only people in the dealership. Oh, did I mention there was a snow storm and this car was fitted with performance tires? Test drive was interesting. Drive home? Oh man. Did I also take it up & down Steven’s Pass for a pre-planned ski trip on Christmas? You betcha’. Snow tires & wheels currently being shopped. In love with this thing. 228i with M Sport has got to be one of the most underrated cars out there. Sport Mode has such an impact on the character of the car. I wanted to share with the Oppo’s out there. More to come!